For longer than time itself has existed, The Bold and the Beautiful television show has been aired to millions across the globe. If you've ever managed to last through an entire episode, you would know the acting is questionable and the humour very dry. 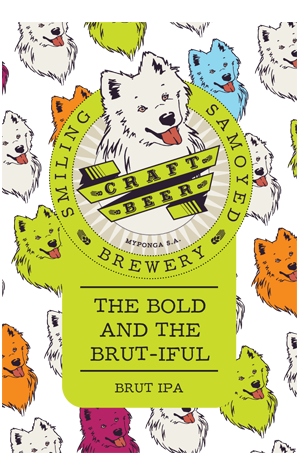 This limited release from Smiling Samoyed can relate to the show in some, if not all, ways, not least as their first crack at a Brut IPA bears the name The Bold and the Brut-iful. Possessing the lightest shade of yellow imaginable (go on, try to imagine it) and super clear, its clean, white and fluffy head serves up white wine and slightly tropical aromas, with the hops joined by a touch of pilsner malt on the nose too. A medium to medium-light mouthfeel is supported by a quite sprightly carbonation that brings the white wine and tropical fruit flavours to life before things wrap up dry. Unlike the TV show (other than for the sedated and heavily ironic), it's a beer likely to have you coming back for more.